NPS was appointed to provide full design of the building engineering services to a scheme which involved the substantial refurbishment of an existing Victorian office block into a new private healthcare facility, Montefiore Hospital. Our works included the installation of new power, telephone and data, lighting, security, access control, CCTV, domestic water services, above ground drainage, natural gas pipework, medical gases pipework, heating installations, mechanical ventilation systems, ultra clean ventilation to operating theatres, mechanical cooling installations, and central plant to support the new installations. We were also appointed as sustainability consultants and BREEAM Healthcare Assessor – the project has achieved BREEAM ‘Very Good’ rating. The client brief was for the facility to be exemplar, both in terms of the delivery of service to end clients, but also in terms of the energy usage of the facility. The client also made substantial changes to the scheme after works had commenced on site, and we were able to react quickly to prevent abortive works on site and provide revised design information promptly to maintain installation progress, incorporating the changes. 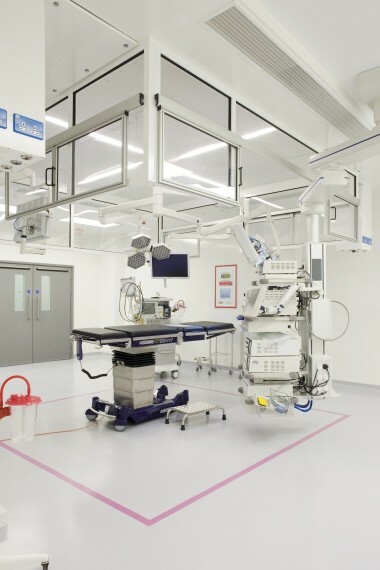 The completed facility contains a kitchen and restaurant, oncology treatment and consulting rooms, diagnostics department with CT scanner and MRI scanner, day care facilities and patient rooms, with three operating theatres and associated support spaces including Clean and Sterile Services Department (CSSD) and third floor hospital administration space.